I recently received a number of vintage and antique catalogs, from my good friend Lady Carolyn. Most of them - Delineators, McCalls, Bella Hess - are in very fragile condition, but appear to be complete. These documents are absolute treasure troves of information, and I want to share them with you. I've thus set out on a project to digitize all of these old publications, for free PDF download or nominally-priced print-on-demand book, for anyone who may want a copy. This is the front cover. On the left is the original scan, with all the damage. This poor catalogue had been eaten by mice and worms, had moisture buckling, and missing pieces that broke off from being folded. 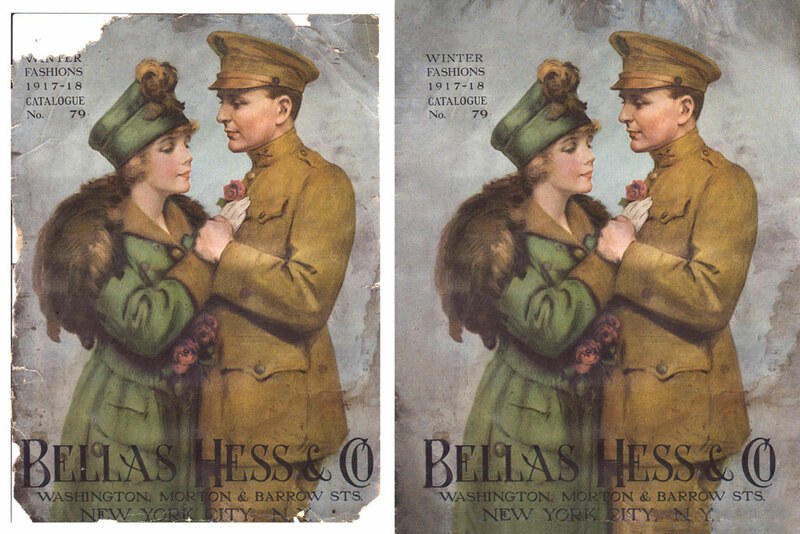 On the right is my reconstruction, formatted for 8.5 x 11 printing - I filled in the gaps around the edges just a bit. Above is the original scan of one of the pages. You can see the damaged bits, and how the pages have yellowed over the past 100 years. For the PDF and printed book, I'm limited in file size and also interior printing to having to make these pages black and white, so I've desaturated them, brightened and upped the contrast. 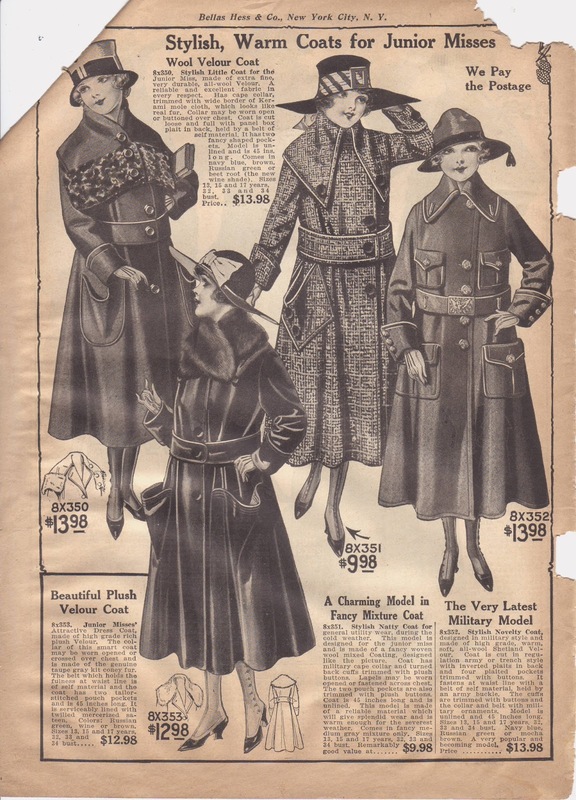 Here are just a few of the pages...again, there are 275, mostly women's and girl's clothing, but the catalogue also has some boys and mens, some novelty items, jewelry, linen, hats, shoes, gloves, long underwear, corsets, and even sanitary supplies. This is one of my favorite pages - Elastic waists in petticoats! This is why catalogues like these are so valuable...they prove or disprove assumptions we in the future have made about how clothing was made and worn. This catalogue has quite a few gorgeous color pages, which will be in the PDF, but not in the printed book. I'll share them with you later. For now, I hope these inspire you! Use them as you like - all of these images are in the public domain, and I believe that information like this should be shared for everyone's benefit. They should be shared! 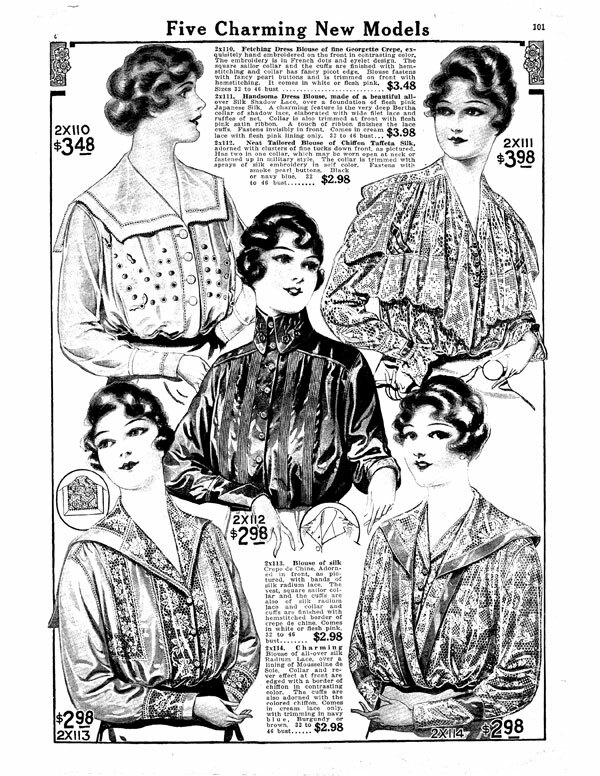 I thought about doing just the women's fashion pages, but the other things in the catalog were equally as interesting, and help put things in context, so I just did the whole thing. The good news is that all the pages are scanned, cleaned up, and formatted now - it's getting there! These are great! Thank you so much for taking the time to scan them and make them available for everyone! Thank you so much for scanning these! I've been trying to find inspiration for a Downton Abbey Tea we're putting together at my library for March, and I think these will give me lots of outfit ideas! More ideas than you can handle - there are literally hundreds of coats, dresses, and blouses. I'm blown away by the variety and just from one store. What a wonderful contribution you are making to our image collections! I wish I had another 1912 show in the offing--last time my old Delineator images were well-thumbed and sourced! These old catalogues are so important. What if your Delineator, or my Bellas Hess is the last of its kind, y'know? I think they should be shared, enjoyed, and referenced by everyone. These are great! Thanks so much for taking the time to make them available. So true! It was a novel concept and must've been quite wonder. These days it's like anathema for all but pajama pants! I took the liberty of "running price checks" on all the items listed. Basically, I ran them through an inflation calculator to see what 1917 prices amount to in modern times. If anyone else is curious here they are listed by page and numerical order for that particular page. Junior Miss Page: $9.98=$179.32. $12.98=$233.22. $13.98=$251.19. 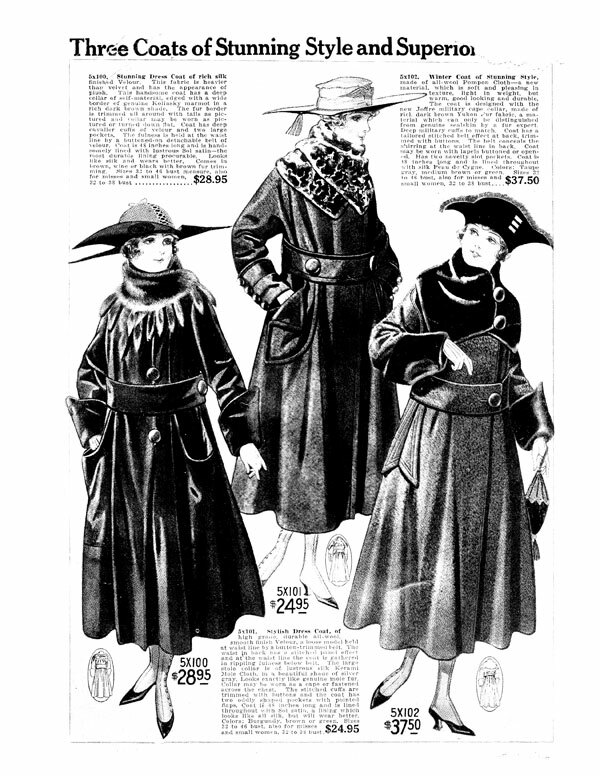 Coats of Stunning Style Page: $24.95=$448.30. $28.95=520.17. $37.50=673.80. New Model Page: $2.98=$53.54. $3.48=62.53. $3.98=$71.51. 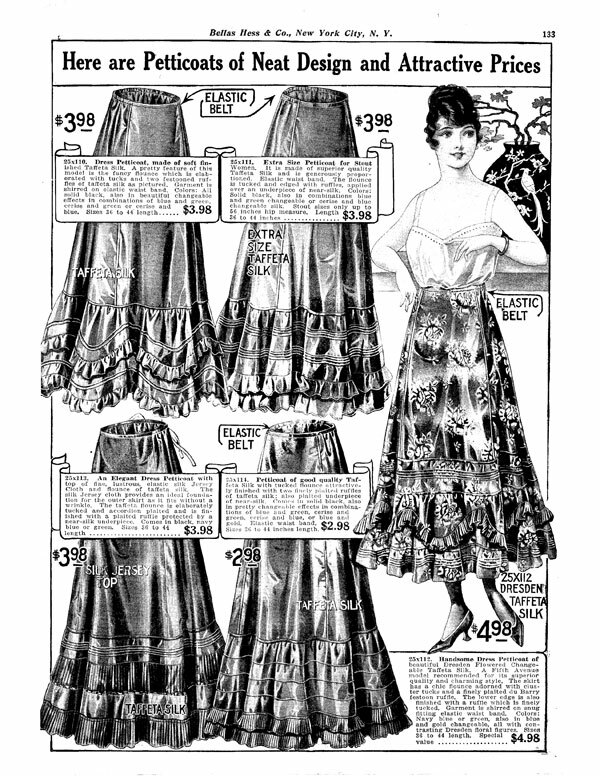 Petticoats Page: $2.98=53.54. $3.98=71.51. $4.98=$89.48. 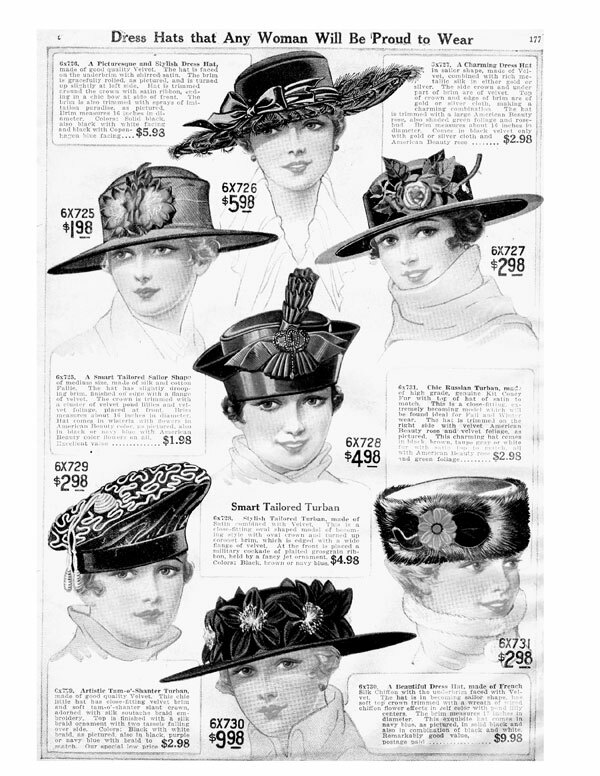 Dress Hats Page: $1.98=$35.58 (I'll admit this is STILL a steal in Modern Day!) $2.98=53.54. $4.98=$89.48. $5.98=$107.45. $9.98=179.32. $60-$80?! In 1917?! Those must be like the Louboutins of their day! My source for the inflation calculator is http://www.westegg.com/inflation/ because it goes back to 1800 (in US Dollars), further than most inflation calculators on the internet. Shoes costing $60-$80 in 1917 amounts to roughly $1,080-$1,440. Two things ought to be taken into consideration. 1) Certain taxes did not exist until "recently" and for a long while the US accepted British Pounds as a form of payment (not quite sure how they worked this all out), so all inflation calculations should be taken with a grain of salt; but it is pretty safe to say, either way, these items you've scanned are pricey! 2) In the same vein, your scanned catalog was "selling the fantasy" similar to Modern magazines' fashion layouts depicting a quaint $1M shoe next to $2B worth of jewels and a smattering of rose petals for good measure ;-) . . . In other words, the catalog in your possession is not exactly a "realistic" Good Housekeeping kind of periodical, I think it's more along the lines of Town and Country on steroids-type prices. But man, can we dream! Those hats! THAT COAT! I covet'em! Oh no, sorry for the confusion! The boots cost, like, $2.50 - $4.00 on the pages, and using the inflation calculator (a different one than the westegg one), it was coming out to about $60 - $80 in today's money. Oh okay! See that makes more sense! When I thought it was the other way around, I kinda wondered "what shady business is Bellas Hess, running here??" What an undertaking! Thank you so, so much for preserving this wonderful history! Thank you so much for doing this work! This was really quite an undertaking and I am looking forward to seeing the final result.